Think out of the box. The premise that taxing produces less is simplistic and wrong. Imagine a federal income tax that ranged from 8% to 28% that was paired with a wealth tax ranging from 2% down to zero (and no payroll taxes). To encourage economic mobility, a sum of $500,000 could be saved wealth tax free (for retirement, health care or education). Wealth taxes paid over a lifetime would also offset estate taxes of 28%. Corporate tax reform would be as simple as replacing the payroll tax with a 4% VAT and lowering the C corporation tax to 8%. The inverse taxation of wealth and income, combined with a million-dollar exemption for families incentivizes lifetime productivity and middle class savings. Most workers would gladly pay a 2% wealth tax to lower their income tax rate to just 8% (about the same as they now pay in payroll tax). Some high profit wealthy people might make the same election but rich people with modest profits would be inclined to choose a higher income tax to reduce or eliminate any tax on their wealth. With a system that self-separates the productive/profitable wealthy from the non-productive, the inverse taxation of wealth and income encourages productivity and wealth. I agree with the premise that government taxation should not be a penny more than necessary to run the government. 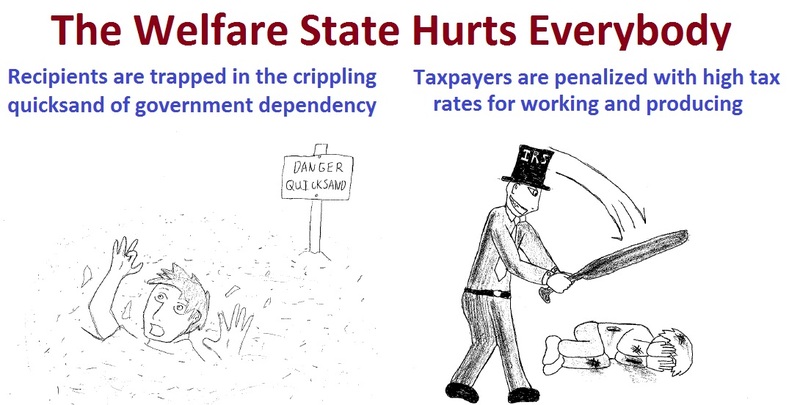 Today governments benefits are based on income and family wealth is not considered. There is a role for government to help those with low income and no wealth but it is wasteful for government to give benefits or tax expenditures (credits, deductions, special rates, deferrals and exemptions) to millionaires who no longer need any government help. With the inverse taxation of wealth and income the government would have the necessary data to focus government spending on need an not waste tax dollars on wealthy families with modest income. I agree with Phineas that the current welfare traps people in poverty. Instead we need a federal UBI set at the poverty line. Blue states can make up the difference and then find the money to pay for it through taxes. Red states can leave additional funding to charities, with individuals voluntarily contributing. This incubator approach will allow the best state programs to be revealed, and we all know what the results will show. The current system is awful, but you are not going to get rid of it by proposing the elimination of ALL support.